I’m pulling out all the stops for this year’s Annual Weight Loss Month Or So. (See all my gluten free entries for the theme of last year’s Annual Weight Loss Month Or So.) This year I’m using my new FitBit Force (thanks mom!) in conjunction with the Lose It! App I’ve been using for the past year minus the last few months. I’m going gluten-reduced, and focusing on increasing any possible daily activity (hence the fitbit) and eating lots of greens and low fat protein. Oh, and as much hot yoga as I can get to, because I love it. (Insert shameless plug for CorePower Yoga here.) 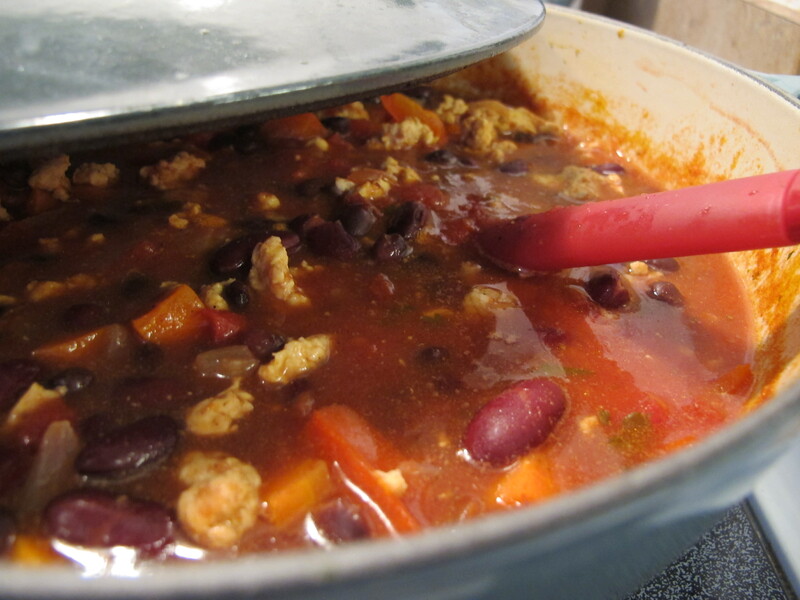 This chili has approximately 200 calories per 1 cup serving (not including toppings), is easy to make, and filling. Plus, beans are good for you. Put the onion, pepper, and carrots in a large pot with the oil, cook over medium heat, stirring occasionally, until vegetables are soft. Add the spice mix or cumin and stir until incorporated. Add the turkey, raise the heat and cook until meat is no longer pink. Add tomatoes, lime juice, water, chipotle, and salt. Cover and simmer at least 30 minutes. Add beans and cook, partially covered, at least 10 minutes longer.This can be eaten immediately but is best when left on low heat for a few hours. Season to taste before serving with more salt, pepper, or lime juice.